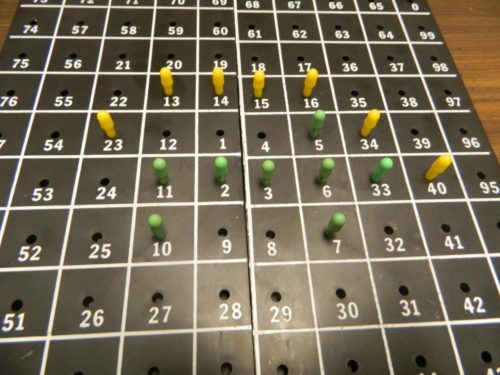 One of the most popular “board” games of all time is Tic-Tac-Toe. It would be rare in most areas of the world to find someone who has never played Tic-Tac-Toe or a similar game before. The reason that the game is so well known is that it is so easy to play. Basically you just have to try and get three in a row while preventing your opponent from doing the same. Tic-Tac-Toe kind of suffers from its’ simplicity though since the game gets really repetitive and is actually a game that has been solved. Since Tic-Tac-Toe is well known but also quite flawed, there have been many attempts to try and add some complexity to the game to spice things up. Today I am looking at one of these games called 5ive Straight which unsurprisingly has you trying to get five in a row. 5ive Straight has some interesting ideas but the game doesn’t live up to its’ potential due to its’ reliance on luck. 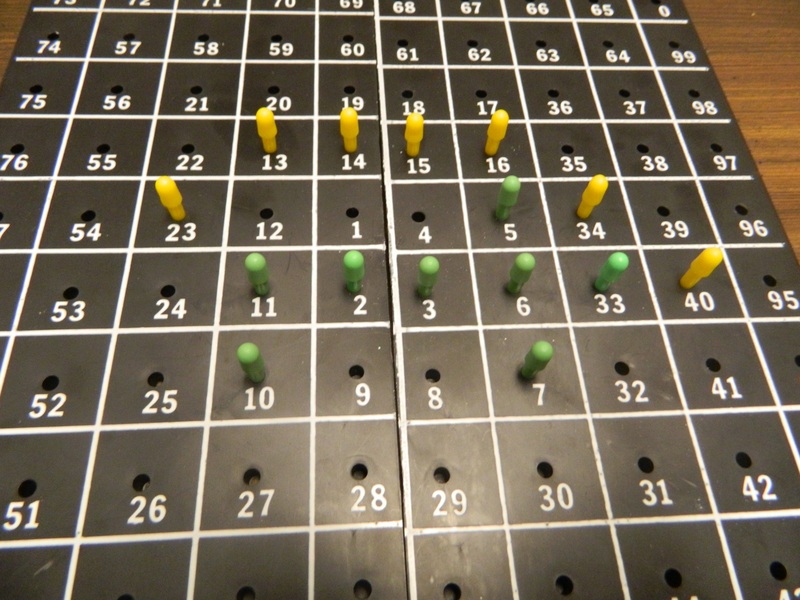 To begin the game the players divide up into two or three teams with each team taking a different colored set of pegs. Players sit alternating between teams. Each player is dealt four cards. The player to the left of the dealer plays first. Play a card and place a peg onto the board. 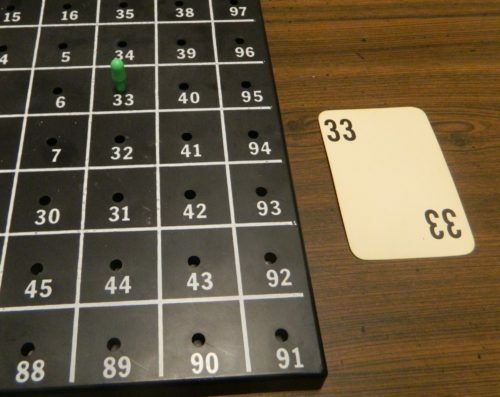 When a player plays a card they can place one of their pegs on any number on the board equal to or larger than the number on the card that they played. This player has played card 33. They can place a peg in one space in the range of 33-99. If the number on the card and all higher numbers have a peg in them, the card cannot be played and has to stay in the player’s hand. If a player should ever have a hand of four cards that can no longer be played, the game ends immediately. If the player doesn’t currently have four cards in their hand (hand size limit in the game is four), the player can choose to draw a card instead of playing a card. A team wins the game if they are able to get five pegs in a row vertically, horizontally or diagonally. The green team has won the game since they were able to get five pegs in a row. Basically if you had to describe 5ive Straight in a couple words it would have to be a more strategic Tic-Tac-Toe. The goal of both games are the same except that you are trying to get five in a row instead of three like you would in Tic-Tac-Toe. While the two games have the same basic premise, 5ive Straight is actually considerably better because there is considerably more strategy in the game. Since it is basically a variant of Tic-Tac-Toe it is not surprising that 5ive Straight is a really easy and straightforward game. 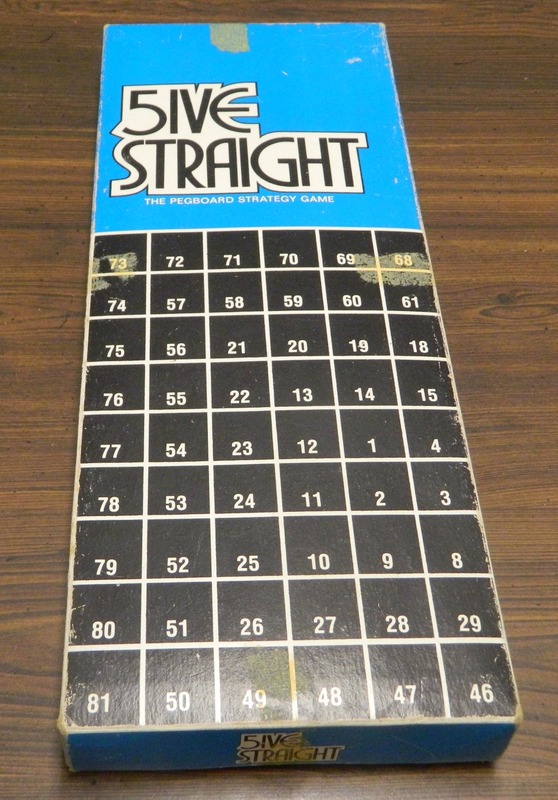 While it takes a while to adjust to how the numbers are laid out on the board, as long as you can count up to 99 and know how to play Tic-Tac-Toe you shouldn’t have a problem playing the game. Having to get five pegs in the row obviously makes 5ive Straight more strategic but most of the strategy in the game comes from how you choose to use your cards. While you don’t have a lot of choice when you get high cards, you actually have a lot of choices when it comes to using lower numbers. Probably the best way to use low cards are to take spots in the middle of the board which give you more options to create five in a row and are also harder to block since your opponents will also need low cards. You can also use your low cards to block when another team is close to getting five in a row. Finally you can use a low card as a wild card for other spots on the board when you are close to getting five in a row. With how valuable low cards are in the game, there is strategy in trying to get other players to waste their low cards blocking you. You may want to get four in a row just to force another player to have to waste a low card to prevent you from winning. While it will stop you from winning, you got them to waste one of their best cards to block you. This back and forth mechanic between the players makes the game a lot more interesting than you would think. Another interesting idea in the game involves hand management. Since you can only have four cards in your hand at a time, it becomes important to manage your hand or you might get stuck with dead cards that you can no longer play. Sometimes you have to play a high card even if it doesn’t help you just to get it out of your hand before it becomes a dead card. Choosing when to play and draw cards can also be an interesting decision. You are always going to want to play a card but you can’t since you need to keep cards in your hand. Choosing when to play and draw cards can sometimes be a big decision in the game. While I only played the game as a three player game, I believe that it is a much better as a three player/team game than than a two player/team game. I think the game benefits from three teams because it is harder to get five in a row since with two teams trying to stop you it is much easier than if only one team is trying to stop you. One thing I wonder is how the game would support four teams. The game only includes pegs for three teams but if you get another group of pegs you could play the game with four teams. I think having four teams would make the game interesting since there would be more competition on the board but I would be a little worried that the board would get too crowded and there would be too many draws where no one ends up winning. 5ive Straight has a lot of interesting things going for it but it really suffers from the card draw luck. It really doesn’t matter how good your strategy is if you can’t draw lower numbered cards. Recent board games try to eliminate some of the card draw luck by giving every card some sort of advantage but that is not the case in 5ive Straight. Lower cards are better than higher cards in every possible way. If you end up drawing a lot of high cards you will have to luck into getting five in a row mostly due to the other players not noticing your moves. If you only draw high numbers you also can’t block players that play in areas that require low cards. While a good strategy can help you in the game, if all players are equally skilled the luckiest player is going to win almost all of the time. This basically ruins most of the game’s strategy which is a shame since 5ive Straight could have had quite a bit of strategy. 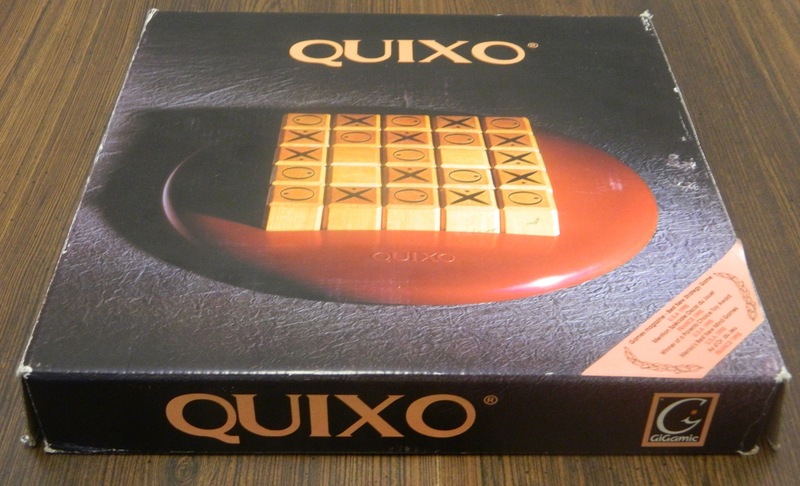 Finally due to being a game from the 1960s it is not a huge surprise that the game’s components are kind of bland. Basically the game consists of a bland pegboard, pegs and some cards that just feature numbers on them. There is nothing wrong with the game’s component quality but the components are just so dull. 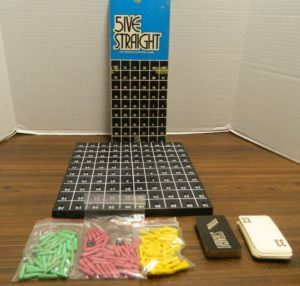 5ive Straight is definitely not a game that you play if you want to look at pretty components. Overall I found 5ive Straight to be a solid little family game. The game is really simple and yet has a decent amount of strategy. How you choose to play your cards has an impact on your fate in the game. 5ive Straight has some good mechanics and is fun to play. The problem is that your strategic options are severely limited based on what cards you end up drawing. Draw bad cards and it doesn’t matter how good your strategy is since you won’t win the game. 5ive Straight is a very solid game that I have no problem playing. It is not a game that I would regularly play but it is a game that I would occasionally play. 5ive Straight is not going to be for everyone though. 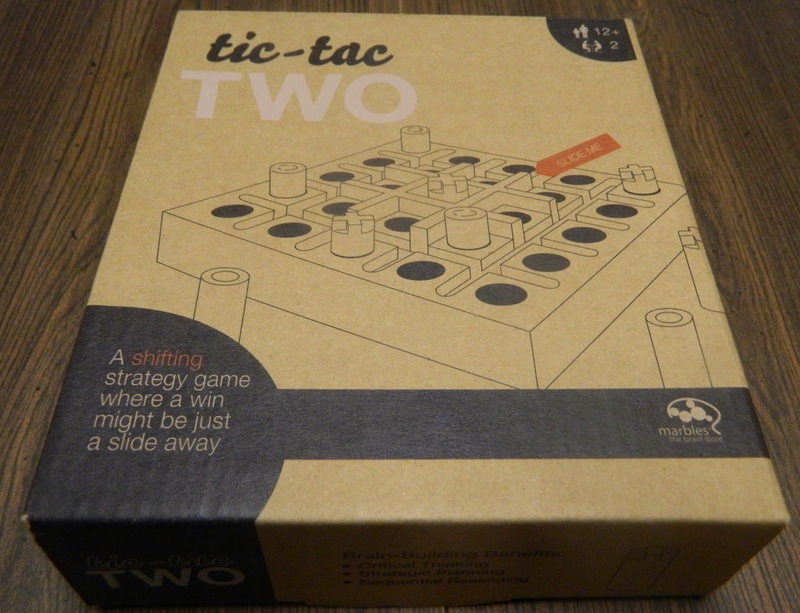 If you don’t really like abstract games or aren’t looking for a more strategic Tic-Tac-Toe, it probably won’t be for you. If you are looking for a simple game that has a decent amount of strategy though, 5ive Straight may be a game you want to check out. A better and more advanced version of Tic-Tac-Toe. Has some interesting decisions for such a simple game. Relies heavily on card draw luck. The components are really basic/bland.